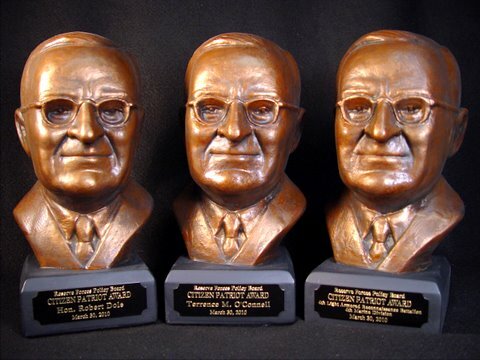 Local artist Robert Toth was honored to learn that his sculptures of President Harry Truman would be awarded to this year's winners of the Citizen Patriot Awards for Distinguished Service. The Pentagon ordered three of the sculptures from Toth to give as awards. The Citizen Patriot Award is the highest award conferred by the Reserve Forces Policy Board and recognizes individuals who have demonstrated exemplary service to the Reserve Components at the national level. This year's awards went to Robert Dole, Terrence M. O'Connell and the 4th Light Armored Reconnaisance Battalion,4th Marine Division.